Editor’s introductory note: Masonry heaters, many of them self-built, warm millions of homes in the former USSR, where Alex Chernov grew up. Now working as a certified heater mason in Canada, Alex designs and builds heaters and ovens, and consults on projects all over the world through his company, Stovemaster (his website offers a wealth of background info). In the article below, he combines his professional expertise with his own background and experience in a culture where most people have long experience heating with wood, and where building one’s own heater was not unusual. The ideas (and drawings) offer a practical, simple, inexpensive “single skin” masonry heater that need be no more complex than the now notorious “rocket stove.” He calls it a “Russian Rocket.” We’re delighted to have him add his voice to the conversation about home heat. One of the first detailed conversations I had about rocket stoves was a lengthy on and off discussion with John Fisher, a good friend, MHA (Masonry Heater Association) member, and a well-known Swedish oven and heater builder. John was fascinated and convinced it was worth exploring. He drew my close attention to the subject by sharing his thoughts and ideas and recommending a book written by Ianto Evans. After reading, talking to many heater builders, seeing rocket stoves in operation, participating in some rocket workshops, and thinking a lot, I have some ideas that I wanted to share. Simple construction that uses widely available, reclaimed and salvaged materials, so it’s inexpensive to build. Promise of cleaner combustion than in other types of fireboxes. Top surface of the steel drum can be a cook top. The design doesn’t lend itself to a built-in bake oven. Nor does it allow an easy way to have a view of the fire. 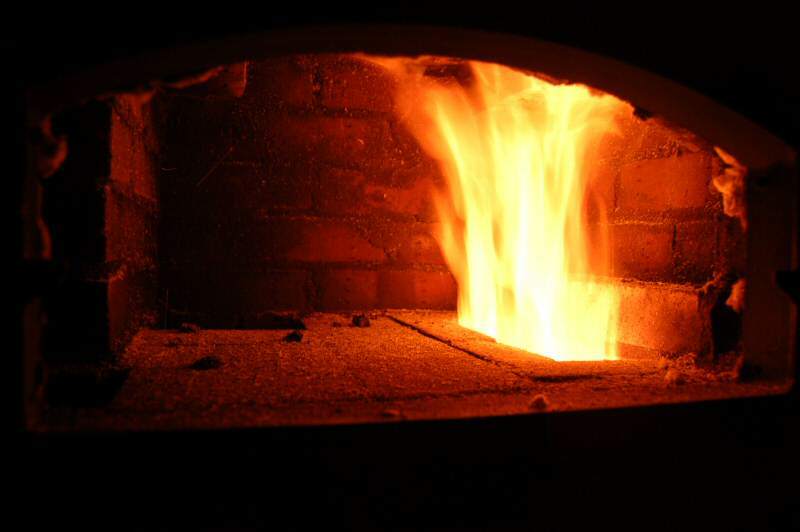 A promise of very clean combustion in an upside-down firebox appeals to many heater builders and other â€œpyromaniacsâ€, who form a good-sized group of followers who are trying to develop an ultimate firebox. But what does it offer the average home owner? For an average home owner, masonry heaters should be more appealing, but many seem to prefer the rocket stove design. Why? 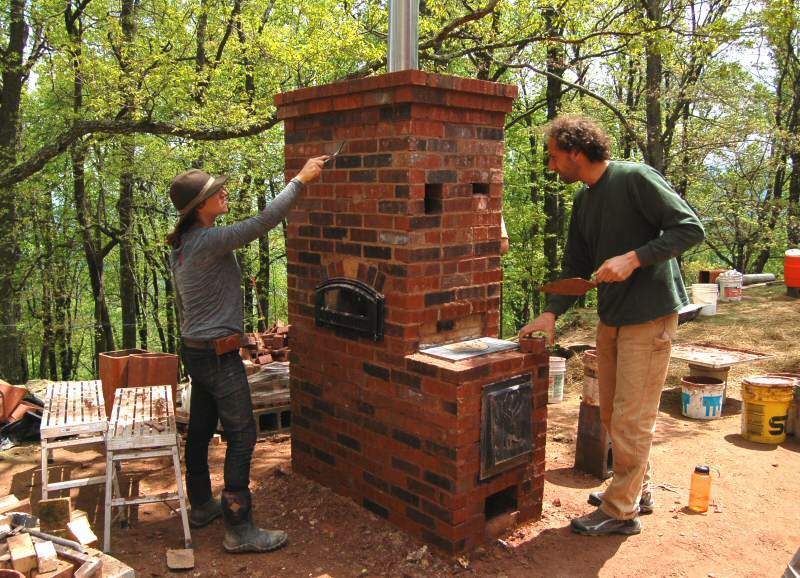 During one of the MHA annual meetings a couple of years ago, a young fellow from Asheville, NC, said that he liked masonry heaters very much, but for his small home he chose a rocket stove design because it was less expensive to build. He wasnâ€™t very satisfied with its performance, but said it was the only masonry heater he could afford. Then it dawned on me that a rocket stove is perceived by many as the only way to build an inexpensive and simple masonry heater. This, however, is incorrect, as shown over the centuries in Eastern Europe and Russia. This kind of traditional heater is what I would like to describe in this article. Masonry heaters get expensive because of the building code and ASTM 1602 requirements for a complete refractory core, and because of the way they are typically built in North America to resemble traditional open fireplaces. Rocket stoves are cheap because they are built with a single skin using basic clay brick and clay mortar, with only a few bricks in the firebox and burn tube. As such, rocket stoves do not comply with the building codes. However, if one does not want or doesnâ€™t have to follow requirements of the building codes, why not build single-skin masonry heaters the way they were always built in the Eastern Europe and Russia? You can use recycled bricks and clay mortar that you make yourself. You can even build with unfired clay bricks. While it’s not absolutely necessary to use firebrick in the firebox itself, without such a liner, the firebox will deteriorate pretty quickly and require frequent re-construction. And the number of firebricks needed for a firebox liner in such simple heater is comparable to what is required for a classic rocket stove.Â Doors can be cast-iron, cheap chimney clean-outs, or simple home-made tin doors like those used in Swedish kakelugns. This way, the cost of a single-skin masonry heater need be no higher than for a rocket stove. Single-skin masonry heaters are also typically designed to be built with the simplest hand tools, and as such are well suited for a do-it-yourself builder â€” much less complicated and easier than the double-wall designs required by code. I am not aware of any proper contemporary emission testing done to date on rocket mass heaters. One of the most comprehensive scientific studies ever done on emissions of heating rocket stove principle was work done by Dr. Richard C. Hill in 1977-79 that resulted in development of what is called a Hill Furnace.Â Emissions were measured by smoke spot meter and by measuring CO in the stack. The spot meter recorded emissions similar to standard woodstove on the start up and overall CO levels were around average 2100ppm. Norbert Senf of Masonry Heat Builders has recently conducted some rocket stove experiments that included some CO testing. Comparing this emission data, one can see that the best available current masonry heater technology offers emission levels as low and in some cases lower than that of tested rocket stoves. Well-designed grundofen heaters operate at CO levels lower than 1000ppm (Austria has CO emission limit of 1100ppm), well-designed contraflow and double-bell heaters operate at average particulate emission levels between 1-1.5 g/kg and fairly low CO levels, as shown by this HeatKit roport. I would like to draw your attention to the fact that masonry heaters of the best design achieve these low emission levels with large loads of fuel that require minimal â€” if any â€” user management after lighting. The best masonry heater firebox design principles can be used in simple, cheap, single-skin masonry heaters. A large firebox designed for clean burning can keep emissions low while avoiding the major drawbacks of the rocket stove: the necessity to feed fuel in very small batches and the necessity of tending a finicky fire. This basic recipe allows for a simple, dirt-cheap, compact, efficient and clean-burning heater. A flexible design offers easy modification. A Russian double-bell heater design system developed by I. Podgorodnikov and expanded by Igor Kuznetsov fits this purpose the best. Indeed, the majority of masonry heaters in Russia are still built as single-skin heaters, with hundreds of different designs that can be easily adapted to suit many situations. I believe it is time to embrace traditional Russian heater building technology, combining it with the latest achievements in firebox design, and creating a way to build versatile inexpensive single-skin heaters. The heater we built at the 2011 MHA meeting was a simple, compact unit large enough to heat a good-sized (well-insulated) home, with all necessary functions in one unit: heating, a black bake oven and a small cook-top, vented by 6â€ diameter chimney. A slightly longer version of this article was originally published in theÂ MHA News. Â Alex plans to provide plans for the “Russian Rocket” on his website, Stovemaster. Jon Santiago’s experiences using this design with adobe bricks. I have been gearing up to build a rocket mass heater in my walkout basement. I even purchased a $15 plan (Annex) from Erni and Erica… http://www.ernieanderica.info/shop . I would love to build a masonry heater in my living room up stairs. One problem I’m having at the moment is that I can’t find enough information on-line to get a feel if it is a DIY-type project. I might be willing to pay $75 for a Finnish masonry corner heater (http://www.mha-net.org/html/bookstore-portfolio.htm); however, I am skeptical that it will provide the amount of detail I would need (step-by-step, with drawings, etc.). I’ve compiled a lot of links to suppliers in my area (Lansing-Detroit Michigan) of fire-brick and furnace-mortar. Can someone post links to pictures of construction, lists of materials and guestimate of 2015 costs (US$)? I am working on building the house portion at the moment in the N. Oakland Co. area and am planning for masonry heater. Doing a lot of reading for efficient heating/volume requirements/cost, etc. Have you made any progress on your project? Am interested as well in your materials research so as not to reinvent the wheel. Great article. I remember seeing the “russian rocket” at the MHA conference. The cabin stove is a brilliant evolution to that design. Way to go Miles. Great article. I remember seeing the â€œrussian rocketâ€ at the MHA conference. The cabin stove is a brilliant evolution to that design. Way to go, Max. Keep your thermostat set at 50 deeegrs if you intend to do this, I have a vent less gas fired wall heater in my living room and love it cause it costs very little to run and keeps the room toasty warm. I use an electric blanket on the bed that I preheat before getting into bed and then shut off when I do get into bed. I would be afraid of sleeping with electric heaters running. Appreciate your report. Long time builder of rocket stoves with just concrete block or pavers, but wanted an oven (Horno). Reading your information, the images and plans are a great assist.